Summer in Steamboat is house selling season! Fortunately for buyers, our depleted inventory received a boost as 161 new listings recently hit the market. May is typically the month with the most new listings and that stayed true this year; nonetheless, this May’s new inventory was lower than previous years. In Steamboat, like most markets across the country, demand outweighs supply. Current active listings (429) has remained relatively at for the last eight months. is is signi cantly lower than just two years ago when there were over 800 active listings. Buyers, especially in the lower price range, remain challenged. Sellers, on the other hand, clearly know that the market is tilted in their favor; the average list price of a new property has risen 32% in the last year up to $1.6M. Price per square foot, an even better indicator, is up to $474/sq. ft., from $405/sq. ft. this time last year. e spread between the average list price and the estimated value is increasing, showing that sellers realize that the market is rising. Nonetheless, there are categories that have a healthy supply or certain individual properties that are priced below the market. While much of the market has rebounded to 2007 peak pricing, there remains neighborhoods and developments that have not. at being said, let us help you dig a little deeper to nd a hidden gem. With more tourists than ever in Steamboat, many of them will fall in love and become second home owners or locals. is makes the competition to nd properties even more challenging. It’s unknown if the recent interest rate hikes will impact buyers, but it’s likely to, especially at the lower end of the market. 30-year xed mortgage rates are now hovering around 4.75% and expected to rise as the Fed continues to escalate rates. 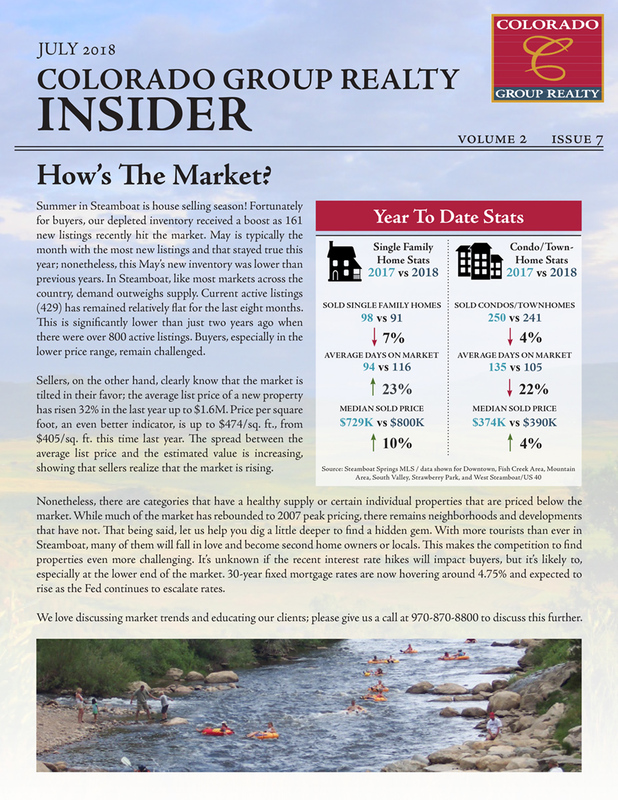 We love discussing market trends and educating our clients; please give us a call at 970-870-8800 to discuss this further.